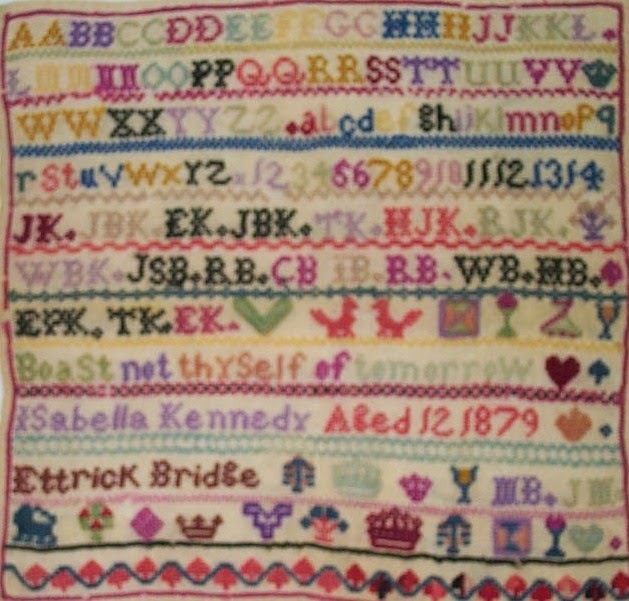 In 1879 a young girl embroidered a sampler bearing the inscription “ Boast not thyself of Tomorrow, Isabella Kennedy aged 12 1879 Ettrick Bridge”. See our February 2104 Newsletter. At some point the sampler came into the possession of Sue Sendall residing in Canada. Her family history research failed to produce any connection at all with the family of Isabella Kennedy. Sue contacted us and asked if we might be able to trace a descendant of the young embroiderer and Society member, Alan Turnbull, did some quite extensive research on the family which he passed on but could find no living relatives. He suggested in the circumstances the sampler might be donated to the local school at Kirkhope which Sue was more than pleased to do. The sampler was duly sent from Canada and having been framed by Alan was presented to the school today, the last day of the summer term. 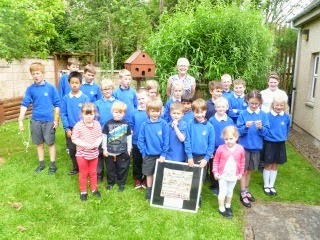 This raised considerable interest from the children but perhaps in some ways more so from their parents and teachers. All thanks to Susan for a most thoughtful donation and to Alan for all his research and facilitating. 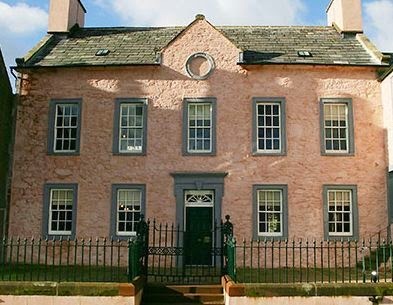 Galloway Family History Fair takes place at Broughton House and Garden, 12 High Street, Kirkcudbright, DG6 4JX from 12 noon to 4pm on Saturday, 14 June 2014. Map. We'll be offering family history advice and we'll have publications for sale. If there's anything you particularly want, let us know on our Contacts page selecting 'Contact the Chairman'. The house opens 12 noon – admission to fair is £1 – refundable against purchases in their shop. Help with your family history queries by Erica Johnston, Dumfries and Galloway Council Family History Officer, in the Research Room. Broughton House was the home of Edward A Hornel, who lived from 1864 to 1933. Borders Family History Society website is down and can't be used. We are waiting for them to resolve it.